China, emerging as a major player in world trade and politics, has earned an enormous amount of coverage in recent weeks. What you won't read, at least in the pages of most mainstream online and print news, is the other way in which China is earning distinction - the nation is fast becoming known as the biggest abuser of animals on earth. With its massive, underpaid labor force and its history of human rights violations, China has never enacted a single law to protect animals in any industry. 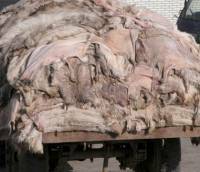 In recent years, China has eclipsed all other countries combined to become the world's largest supplier of fur. Undercover investigations on Chinese fur farms have documented workers savagely beating animals with metal rods and ripping the skins off of animals who are panting, blinking and completely conscious. Cats and dogs in China are bludgeoned, hanged, bled to death and strangled with wire nooses so that their fur can be turned into trim on a coat. A reporter posing as a fur trader visited the "Rabbit King of Jiangsu," owner of the largest fur farm in China, and told readers how rabbits are "strung up by their legs on hooks on a conveyor belt, where female workers grab them by the ears and hack off their heads with oversized scissors." Six hundred rabbits are slaughtered and skinned to trim the collars and cuffs of just 50 women's jackets. China is now also a leading exporter of leather. Dogs, cats, sheep and goats are transported in small cages, their limbs poking out and breaking when the crates are thrown off the truck in the marketplace. They, too, are often skinned alive because there is no requirement that they be stunned or killed before their skin is removed. The atrocities aren't limited to commercial enterprises. Last July, officials in Mouding County in southwest China massacred 50,000 dogs following an outbreak of rabies. Rather than assessing the situation and dealing with the problem responsibly by implementing a dog vaccination program, authorities ordered the slaughter of all dogs, even those who have never put a paw outside a door. Not by injection of a barbiturate, which, while reprehensible, would at least have been painless if done correctly. Instead, officials wielding heavy clubs stormed through the streets and bashed the dogs' heads in while China's next generation, the children, watched. A person's arm gets tired doing all that beating, so, inevitably, many dogs died slowly, cowering in fear and pain as the blows rained down. Could there be any worse place to be an animal than China? While many decent citizens of China advocate for greater protection of animals - People for the Ethical Treatment of Animals has had the privilege of working with some of them to document and expose the animal abuse that is rampant there - their task is enormous. They need support, from other nations and individuals, in order to enact animal protection laws. Certainly a nation that can murder its most vulnerable inhabitants in this way deserves international censure and a loss in trade dollars from the countries it relies upon to buy its exports. Ingrid E. Newkirk is President of People for the Ethical Treatment of Animals, 501 Front St., Norfolk, VA 23510; www.PETA.org.